Carbondale Masonic Lodge No. 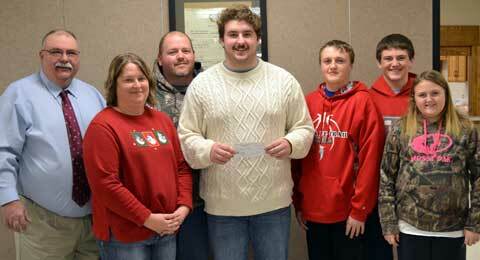 70 presented $1,000 to Osage County Fire District No. 1, accepted by Roy Moore on behalf of the fire district. During Carbondale Masonic Lodge No. 70’s meeting on Dec. 14, 2016, members made two presentations. Santa Fe Trail High School senior Jacob Hastings was recognized for receiving first place locally in the annual Grand Lodge of Kansas 2016 essay contest. Presenting Jacob with his award was WM Duane Shively. Jacob and his family joined lodge members for dinner after the presentation. 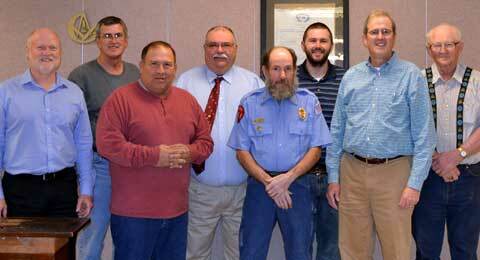 Additionally, the Carbondale lodge donated $1,000 to the Osage County Fire District No. 1 for the purpose of upgrading its facility. Receiving the donation on behalf of the volunteer fire department is Roy Moore, who also joined lodge members for the dinner. Jacob Hastings and family were among honored dinner guests of Carbondale Lodge No. 70 during its December meeting, with Jacob recognized as a winner in the Grand Lodge essay contest. Information and photos thanks to Jerry Clements.